Born from the ashes and smoldering cinders of the Michigan economic meltdown… A blog is born. Unlike other blogs, this one centers on the belief that Rock Bottom is actually a good place to be born (it’s also impervious to the vitriol poison of pessimism). After all, we have nowhere to go but up. More importantly, you cannot create an epic comeback story unless you have been counted out. Michiganders are made of tough stuff. We have the brains to replace the brawn and reinvent our economy. It won’t be easy and it won’t happen overnight. It will take a village of committed people that can put aside ego and partisanship in order to foster the greater good. 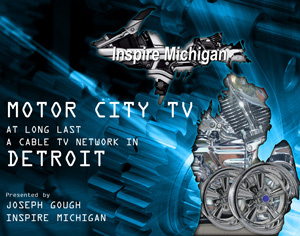 Inspire Michigan is for passionate people who believe that the juice is worth the squeeze, and the squeeze needs a sense of urgency… Simple as that. Let’s get to work.